Over a lifetime of training that began at the age of five, the martial arts have been many things to me. At times it has saved my life, at others it has been my life and today it gives me life. I was a sickly child who stuttered. Kids would tease me because of my speech impediment and say I talked like Porky Pig, an animated character from a Warner Brothers cartoon. I always felt like something was wrong with me because I had to leave class every day after lunch for speech therapy sessions. At the time, I had only been training in the martial arts for a few years. My father, who was also my martial arts instructor, said something to me that would change the way I viewed my speech challenge. He said, “You are very fortunate to have your own private speech coach. You have the opportunity to learn to become a great speaker.” My father’s powerful words gave me the resilience to weather the verbal bullying and overcome my stuttering. It instilled in me the “Never give up” and “Yes I can” attitude that comes with being a martial artist. It gave me the confidence to eventually become a recognized speaker in the martial arts industry. As a kid, I grew up in a tough neighborhood in the Mission district of San Francisco. My family owned one of the better-known karate schools in the city. We had a big yellow lightbox sign on the side of our building that featured our last name in three-foot-tall letters. Because of our notoriety bullies would challenge me regularly. I always knew it was going down when their opening line was, “So you’re that Beliso kid huh? Let’s see some of that karate stuff.” Practicing the martial arts and being able to defend myself saved my life many times over. Then one sad day, my good friend and martial arts classmate Carlo Del Castillo, was shot and killed at the age of fifteen. He was one of the best fighters I knew on and off the mat but not even he couldn’t stop a bullet. The cold reality of Carlo’s death taught me that you can’t fight all the time and that the best fight was the one that you never got into. From the age of eight until seventeen, I would train six days a week, four hours a day, and competed in tournaments every other weekend. During this time, martial arts were my life. I literally ate, slept and drank it 24/7. My father was my trainer and he told me how much to eat and weigh, how many kicks and punches to throw, and how to fight in the ring. I remember one Friday night we were getting some extra workouts for a tournament the next day. I looked at my father and said, “Dad, it’s 9:30 pm, how much more can we train?” He clenched his jaw and cleared his throat as he always did before he was about to say something of great importance. “When you are not training, the other guy is, and he will be the one to beat you tomorrow”my father professed. He trained me well past 11 pm that night. The next day I took first place at the California Karate Championships in both forms and sparring. I went on to win over 100 major tournaments during my competitive years. What I had learned from this way of thinking and training was that if you want to succeed, you have to be willing to work harder than everyone else. It nurtured a kind of work ethic that has helped me to succeed in several businesses and careers. At the age of twenty, I stop competing to pursue a DJ and music career. Over the next ten years, I played in bands and clubs on the local music scene. I would eventually go solo and sign a record deal overseas in the Philippines. I had a number one song and toured extensively. Through all of this, I continued to practice the martial arts. When I lived in the Philippines, the heat and pollution were so bad that I would always have to train after 11 pm. My workout, that consisted of running, shadow boxing, calisthenics, and practicing forms kept me company well into the midnight hour. Meditation rounded out my nightly session as a reminder that the martial arts are my life. It was the one thing that kept me grounded and focused through all the craziness that went with a rock and roll lifestyle. After touring and promoting the album for three years, I returned back home to San Francisco. I had tasted fame and fortune but decided to give it up. Something was missing in my life and I felt like I lacked purpose. I went back to my first love, which was teaching the martial arts. I was offering classes in several different dojos and health clubs when I decided to open my own school with a little help from friends who believed in me. This is when the martial arts gave me the life I live today. Through the opportunities and challenges of growing this business, I learned that my purpose is to serve people and affect change in the martial arts industry. I created a successful business model based on service not selling. I have this vision that we as martial artists and school owners can better serve our communities if we put people before profits instead of behaving like used car salesmen trying to close a contract. I commit myself to this movement by sharing my message with school owners and businesses throughout the world. I have had a love affair with the martial arts for over fifty years. It has been the one constant in my life that has been there to pick me up, steer me in the right direction and is always ready to challenge me to be a better person. 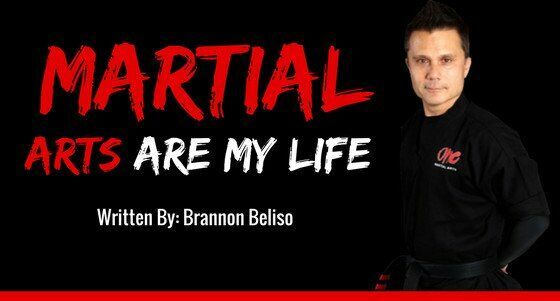 The martial arts have given me the purpose to help people live their best life through service. I am dedicated to mastering myself through the practice of the martial arts because it has saved my life, it is my life and it gives me life.